Drill a hole in the lid for the cork. 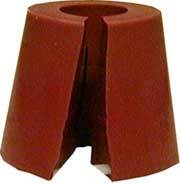 We recommend you purchase a lid where this is already done, because the lid is very easily damaged. Cut the cork with a knife from the side into the hole, so you can then manipulate the cork and place the electrical wire inside. 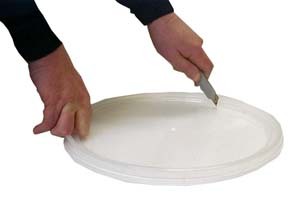 Where the plain lid starts to curve upward, cut with a knife. 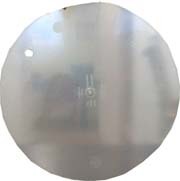 Cut with low pressure, round and round, until you have a round plate, approximately 32cm (about 12.6 inches) in diameter. 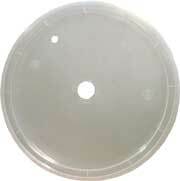 It must not be perfectly round, or else it can stop the alcohol from passing down to the bottom of the large bucket. 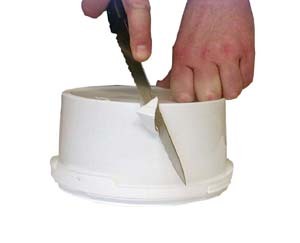 Have some protection underneath so that when you cut through the lid you won't damage the table or counter top. If it has a metal handle, throw it away. 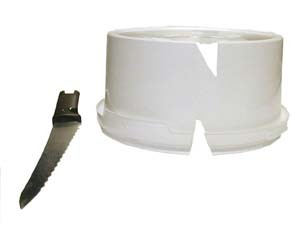 Cut out a piece (wedge) of plastic, approximately 2-3cm (about 1") deep in the edge of the bucket. 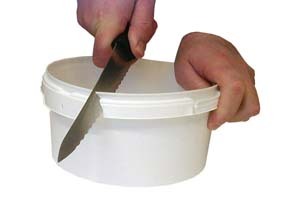 Cut another wedge of plastic, approximately 2-3cm ((about 1") deep where the bottom meets the wall of the bucket. You now have cuts of approximately 2-3cm (about 1") both in the bottom and in the wall. Those cuts are to ensure that the smaller bucket soes not stay filled with air. The cutting can be made much smaller, if preferred.